It’s nearly a decade since Google released its ‘Big Table’ paper. One of the many cool aspects of that paper was the file organisation it uses. The approach is more generally known as the Log Structured Merge Tree, after this 1996 paper (although not specifically referenced as such by Google). In a nutshell LSM trees are designed to provide better write throughput than traditional B+ tree or ISAM approaches. They do this by removing the need to perform random update-in-place operations. The figures in this ACM report here/here make the point well. They show that, somewhat counter intuitively, sequential disk access is faster than randomly accessing main memory. More relevantly they also show sequential access to disk, be it magnetic or SSD, to be at least three orders of magnitude faster and random IO. This means random operations are to be avoided. Sequential access is well worth designing for. On the other hand there are scalability limits, particularly if you have lots of small values. If you’re values were just say simple numbers then the index would be larger than the data file itself. Despite this the pattern is a sensible compromise which is used in many products from Riak through to Oracle Coherence. *A number of tree structures exist which do not require update-in-place. Most popular is the append-only Btree, also know as the copy-on-write tree. These work by overwriting the tree structure, sequentially, at the end of the file each time a writes occurs. Relevant parts of the old tree structure, including the top level node, are orphaned. Through this method update-in-place is avoided as the tree sequentially redefines itself over time. This method does however come at the cost. Rewriting the structure on every write is verbose. It creates a significant amount of write amplification which is a downside unto itself. Lets look at this in a little more detail. When updates arrive they are added to an in-memory buffer, which is usually held as a tree (Red-Black etc) to preserve key-ordering. This ‘memtable’ is replicated on disk as a write-ahead-log in most implementations, simply for recovery purposes. When the memtable fills the sorted data is flushed to a new file on disk. This process repeats as more and more writes come in. Importantly the system is only doing sequential IO as files are not edited. New entries or edits simple create successive files (see fig above). So reads in LSM trees are slower than their in-place brethren. Fortunately there are a couple of tricks which can make the pattern performant. The most common approach is to hold a page-index in memory. This provides a lookup which gets you ‘close’ to your target key. You scan from there as the data is sorted. LevelDB, RocksDB and BigTable do this with a block-index held at the end of each file. This often works better than straight binary search as it allows the user of variable length fields and is better suited to compressed data. LSM is not without it critics though. It’s biggest problem, like GC, is the collection phases and the affect they have on precious IO. There is an interesting discussion of some of these on this hacker news thread. Regular filesystems used today tend to be ‘Journaling’, for example ext3, ext4, HFS etc are tree-based approaches. 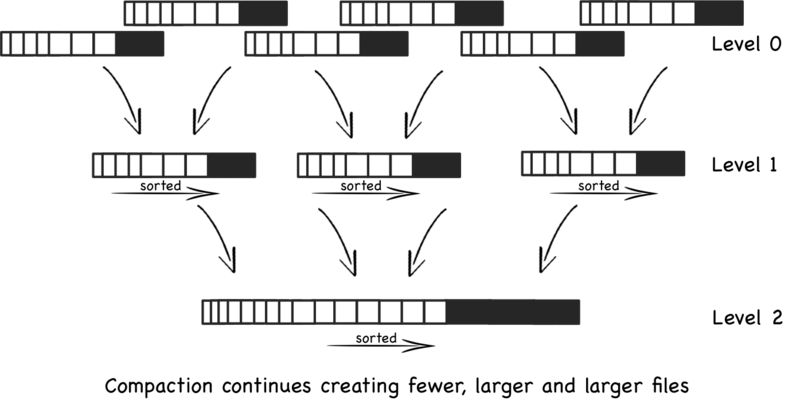 A fixed height tree of inodes represent the directory structure and a journal is used to protect against failure conditions. In these implementations the journal is logical, meaning it only indoor metadata will be journaled. This is for performance reasons. In log structured file systems data is written only once, directly to a journal repressed as a chronologically advancing buffer. The buffer is garbage collected periodically to remove redundant writes. Like LSM’s the log structured file system will write faster, but read slower than it’s dual-writing, tree based counterpart. Again this is acceptable where there is lots of RAM available to feed the file cache or the media doesn’t deal well with update in place, as is the case with flash. Add the numbers ( 11 + 10 ) and SUBTRACT two ?